For Your (Re)Consideration: Exile On Main St.
For Your (Re)Consideration is a feature in which I revisit some older work – one perhaps overlooked, perhaps familiar to the point of forgetting its content – and try to reconsider it with an unsullied perspective. Here’s the strange thing about The Rolling Stones’ album Exile on Main St.: The Stones have never been an “album” band, per se. As a “singles” band they’re unparalleled – putting together a collection of only their undeniably classic songs could easily fill two or three CD’s. But they never really had their Sgt. Peppers; their The Wall; their Thriller – some singular album that defines them. But ask those who know what their best album is, and generally people will say it’s Exile. The funny thing is, though, that none of their big hits are on it. None. There are a couple that are fairly well-known (the two singles off of it were “Tumbling Dice” and “Happy”) but to someone who’s merely a casual fan – as I was when I first came across it – it really doesn’t seem like it could be their greatest. In fact, as someone who, in his foolish youth, was way too alternative and gen-x to really give the Stones fair attention (well, everyone’s heard of them, so they simply can’t be interesting, or worth being that in to! ), I didn’t even give it more than a cursory listen, thinking that someone must have given me a bum steer. But they hadn’t. And when I finally came back to it I was hooked. Is it their best album? Yeah. It is. Yes, that’s debatable; yes, Some Girls; yes, yes, yes. What’s not debatable is just what a solid, beautiful rock album it is – perfect in that rock & roll way of being flawed in the right ways even. In addition to not having any of their signature songs on it, though, it also doesn’t have that quintessential guitar/Jagger sound that you think of when you first think of the band. It’s really almost more of a Keith Richards album than anything else, in many ways. Bluesy, R&B, even gospel; more Richards-introverted than Jagger-extroverted. In fact, listen to the mix, and what you’ll notice almost straight away is that on most of the cuts your can barely hear Jagger’s vocals over the other instruments and back-up vocals. His singing is merely another instrument (which, as you might imagine, Jagger has always hated about the album). It’s also well known for how it was recorded – tracks hidden from earlier producers, recorded on the run from tax problems in England, and in particular the sessions recorded in Nellcote, France. A makeshift studio in Keith Richards’ basement, with musicians coming and going – this mix of fluid creativity, and the elements of drug use eroding at the cohesiveness of the band. The songs are also about the world they’re in – making it not just one of the greatest rock albums, but the album itself – in its subject matter and manner of recording – is one of the greatest albums that is rock & roll. You listen to it and you know, start to finish, that you’re hearing the real thing. If you know it, break it out again. If you vaguely remember it, it’s time to get fully acquainted. If you’ve never really heard it, now’s the time. It’s a classic for a reason. It is as good as we think it is. ← Ladies and Gentlemen, This Is Your Captain Speaking. Who Wants Parfait?! Easily my favourite Stones album for the fact there are no big hits on it, it works as an album in it’s entirity and it all stands prouder for that. The presence of one of their most noted classics would sort of move everything else to the background. “Hit” songs actually ruin albums for me. No matter how great the hit is, one consistent characteristic is that, as a hit, I’ve already heard it too many times. Now that we’ve written about albums can we ramble on about these horseless carriages everyone seems so enthralled with? They are often something written by a hit-writer to push sales. They can diminish the rest. Thomas Dolby’s Golden Age of Wireless was first released without “She Blinded Me With Science” and – even though that’s a perfectly fun pop song – the rest of the album emerges as really high quality without it looming over it. Easily the best of the Stones. Though I have to say, I fell head on in love with Shine a Light, recorded live. I have always been a Stones fan, asked the question Beatles or Stones, always picked Stones. To me the two have always been a question of mood/mindset. Sometimes one is perfect, sometimes the other. Really, never both at the same time. That’s a great idea! I will investigate. I am a Stones fan, and I love that they evolved their sound for so many decades yet made it all sound awesome. For a band that people think of as ‘never changing,’ they have a lot of variations and experiments. You just have to move beyond the hits. Okay, I’ve considered all of your fine points and I will have to go and listen to this album now, just because you told me to. Even though I am a huge Beatles fan, not a Stones fan. And I was forced to listen to them growing up (brothers) so maybe I can find it in my heart to like them, I’m not promising anything though. Give it a couple listens if you can. It’s not a album that explodes in your face. We were just discussing how the art of the “album” has been lost; I think musicians realize listeners now just download the 2 or 3 favorite songs and never listen to the rest. Afew bands can still do it but I miss being able to put on an album & enjoying the entire thing! I’ll have to find this one. I’ve always like Stones songs, turning them up when they hit the radio & singing along. But theres something about Mick that weirds me out….. odd because I love Steven Tyler which makes people laugh at me. I think there are so many songs that I get tired of in a hurry, but I can always listen to the Stones! Nice post. I’ll pass it on to my daughter… The Ultimate Stones Fan. It will definitely give you some cred to shame those pseudo-intellectuals who made you feel bad those years ago. And Hewitt’s album is definitely one of the most important pop albums of all time. As for the Stones not being an album band, may I point you in the direction of that four album run perhaps unequalled by anyone: Beggars Banquet, Let it Bleed, Sticky Fingers, Exile…(I bet I got the order wrong)? “it’s why we fell in love with rock and roll” – exactly it. Exactly. And I don’t think there’s any question that they put out a series of great albums, they’ve just never been known for that album – the one that people listen to first, or that even people who don’t know that band well know (Zeppelin IV, for example). The Stones had their Sgt Pepper’s. It was Their Satanic Majesties Request. I disappeared without a trace. Back in school I did my best to convert as many people to the bluesy Stones. Still listen on occasion. Some days I mash up old albums with the likes of John Mayall and early Fleetwood Mac. I think people can be tough to sell on the albums because everyone feels like they know them already, via the many, many classic singles. I enjoyed this post because it shows more of your range. It’s a well-written review. And I owe you some questions. I have NOT forgotten, I swear! Thanks. I am a multi-faceted gem, I am. And there’s interest, you know. Soon you’ll owe me 25 questions. Nice review. Exile is a great album, but not their best IMHO. There are two that stand out for me: Get Your Ya-Ya’s Out and Their Satantic Majesties Request, which is not only a great lp, which I don’t think it was ever intended to be, but funny as well, as an obvious spoof on the Beatles Sgt. Pepper’s. 25 Questions? Sure, why not – Fire away. 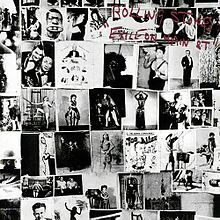 By the way, I’m listening to Exile on Spotify.